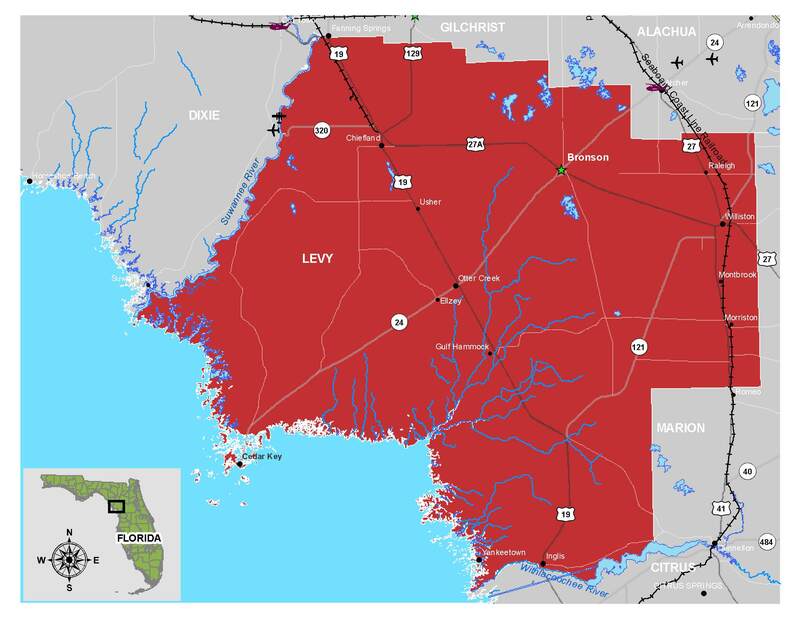 The project will conduct action research in Levy County and the larger Big Bend region along the Gulf Coast of Florida. The Big Bend region is a unique, ecologically valuable expanse of tidal marshes among numerous estuaries. The counties in the rural portion of the Big Bend region are: Levy, Dixie, Taylor, Jefferson, and Wakulla. The Big Bend Seagrasses Aquatic Preserve (shown below) covers over 900,000 acres of submerged lands in the region, and there are numerous land-based natural preserves, however they tend to occur on the coastline and were not designed with sea level rise adaptation (habitat and species migration) in mind. There are more than 600,000 acres of publicly owned or leased land in the region. There are also over 12 small, coastal communities for which the economies are based in fishing, aquaculture, and tourism. Rural areas have important assets, are vulnerable, and need the most planning support. 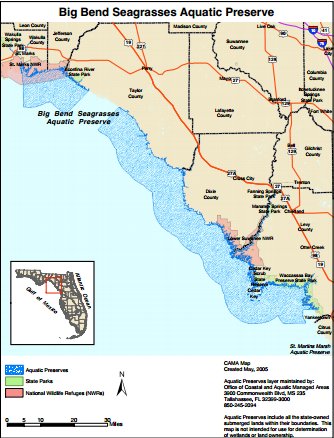 A map of the Big Bend Seagrasses Aquatic Preserve is shown below. Below is a map of Levy County. Below is a Google map with placemarks for Cedar Key, Yankeetown, and Inglis. Cedar Key is a island community located on Way Key in Levy County. The largest island in the “Cedar Keys”, it is best known for its natural resources, historical significance, and fresh seafood. The city’s economy is dominated by eco-toursim and a multi-million dollar aquaculture industry and now is one of the top US producers of farmraised hard clams. To properly ensure the continued success of the Aquaculture industry, water quality monitors are installed along the Big Bend coast including Dog Island near Cedar Key. The monitors help document environmental conditions that could negatively impact calm survival and growth. The monitors act as a decision support tool for a cooperative partnership between the US Department of Agriculture (USDA), University of Florida IFAS, and Florida Department of Agriculture and Consumer Services. Before clam farming became the largest industry, the Cedar Keys area originally became prosperous from harvesting the trees of its namesake. In the late 1800s, it’s economy was driven by sawmills, pencil factories and the fishing industry. However, after a couple of decades of unchecked consumption, the area’s natural resources were becoming depleted. The majority of the cedar trees had been harvested and the supply of shellfish was nearly exhausted. In 1995, a statewide ban on large scale net fishing went into effect, which severely affected the livelihood of Cedar Key residents. The area rebounded after a government retraining program helped many local fishermen begin farming clams, becoming the multi-million dollar industry it is today. Cedar Key’s history confirms the inherent connection and inter-dependency between the land and its people. Sustainable practices are crucial to conserving the natural resources the area relies on. One of the many uniquely pristine areas in the region is the federally protected sanctuary, the Cedar Keys Wildlife Refuge. The refuge includes a chain of barrier islands ideally suited to a vast range of migratory and shore birds, including the elusive white pelican, roseate spoonbill and bald eagle. Maintaining diverse habitats on these islands is important to species biodiversity. According the U.S. Fish and Wildlife Service, “the forested habitat that occurs on the uplands includes live oak, cabbage palm, redbay, eastern red cedar, and laurel oak. The understory plants include cherry laurel, saw palmetto, yaupon, wild olive, prickly pear, and Spanish bayonet. These maritime forests are important to song birds especially as a first stop, resting and feeding place during their spring migration. The lower elevations of the islands, comprising almost 40 percent of the total acreage, are subject to frequent tidal flooding and are dominated by salt marsh with patches of mangrove trees and sandy beaches. An abundance of shorebirds use the beach areas for feeding and resting while the long-legged wading birds that nest on the refuge prefer the marsh areas”. The variety of natural, unique habitats – from salt marshes to Indian shell mounds – requires coastal planning to protect the pristine area that supports much of Cedar Key’s economy. 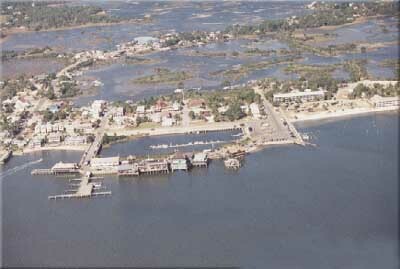 An aerial image of Cedar Key is shown below. Yankeetown is a small coastal town located in the southwest portion of Levy County. 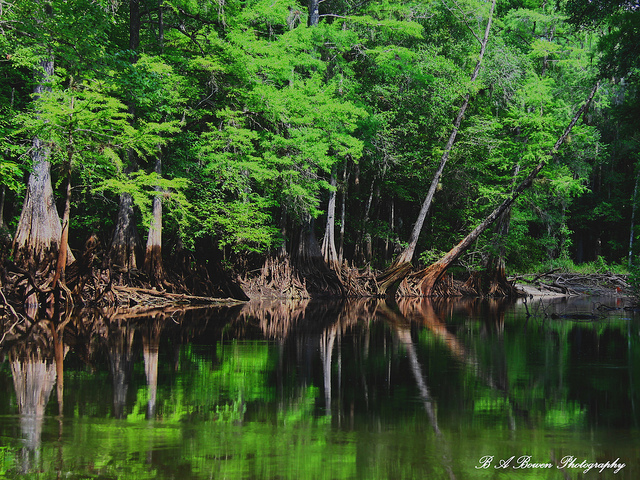 Due to its unspoiled beauty and close proximity to the Withlacoochee River, the town is a mecca for anglers, hunters and naturalists. The River flows into the Gulf of Mexico creating a drainage basin of 1,170 square miles with endless salt marshes and grass flats stretching north and south along the coast. 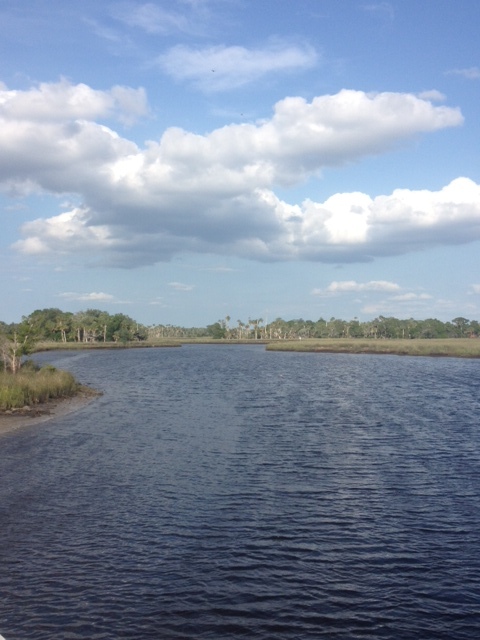 The Waccasassa Bay Preserve State Park extends from Cedar Key to Yankeetown. The Park consists mainly of wet lowlands whose characteristic natural community is hydric hammock. A hydric hammock is defined by the National Wetlands Research Center as “a distinctive type of forested wetland that resides on poorly drained soils or on soils with high water tables. Occasional flooding saturates the soils for enough sufficient time to modify plants species composition”. The Park’s Management Plan emphasizes that the area “contains some of the last remnants of intact Gulf Hammock; outside the preserve much of what was formerly hydric hammock is now pine plantation. Bordering the hydric hammock along the low energy coast of the Gulf of Mexico are vast expanses of tidal marsh. The tidal marsh is dissected by numerous tidal creeks and is dotted with isolated islands of hydric hammock inhabited by semi-tropical and temperate plant species”. 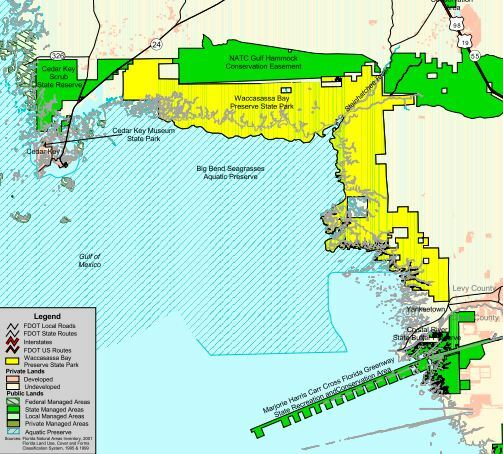 Below is a map of the Wacasassa Bay Preserve State Park. The town of Inglis is located about 4 miles East of Yankeetown and borders the Withlacoochee River. Inglis and Yankeetown are home to the Marjorie Harris Carr Cross Florida Greenway. Formally one of the biggest public works projects in Florida, the land adjacent to the Cross Florida Barge Canal has been transformed into a crucial Florida greenway. This 110 mile corridor connects a wide variety of natural habitats from the Gulf of Mexico to the St. Johns River. An image of the Withlacoochee River South is shown below.